Cheese sandwiches have long been one of my favourite lunchtime snacks. The most basic version features dark German bread, thin slices of young hard cheese, cucumber, salt, and crushed pepper, you could call it my first sandwich creation, born in my early childhood days. But over the years I got a little more experimental: various fruits sneaked in to add their sweetness to ripe cheese, soft cheese, or blue cheese. Mozzarella di Bufala or ricotta are great to bring in some creaminess, and sometimes, I like to take whatever herb or vegetable my eyes catch in the kitchen and turn it into a runny pesto or smooth dip to dollop lusciously on a crusty bun. 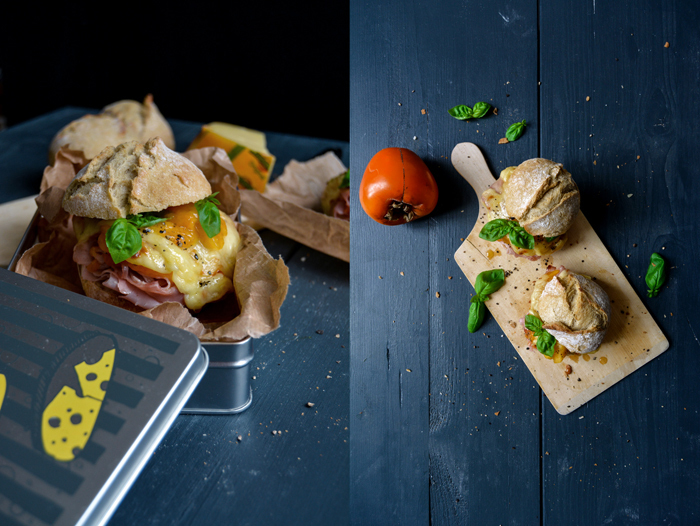 When Leerdammer asked me to create a cheese sandwich for them, I decided to go back to my sandwich roots and think about what a great sandwich should be. I always say that I prefer to focus on a few strong flavours rather than distract my taste buds with too many ingredients. It’s all about the right play of contrast and harmony, in taste and texture. I like Leerdammer for its mild and nutty taste, it’s almost sweet, and it melts fantastically under the broiler. 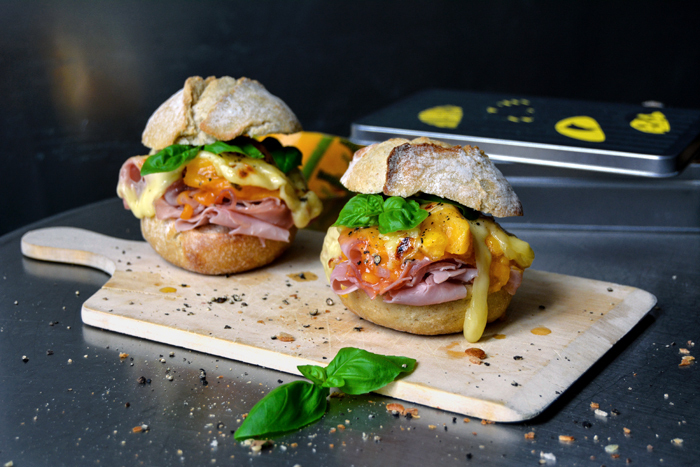 A grilled ham and cheese sandwich felt like the perfect choice but another German sandwich classic came to mind: Toast Hawaii. This child-pleasing creation was a hit in my early sandwich years, pineapple and ham covered in cheese on a slice of toast and grilled. People loved it, including myself. I like pineapple but the market has far more to offer at the moment, so I went for honey-sweet persimmon. The fruit has to be ripe and soft as jelly, in combination with the ham and melted cheese, it almost felt like jam, or a chutney without the sourness. A few basil leaves sprinkled on top give it the spring feeling that I crave so much and make this sandwich feel light and fresh. 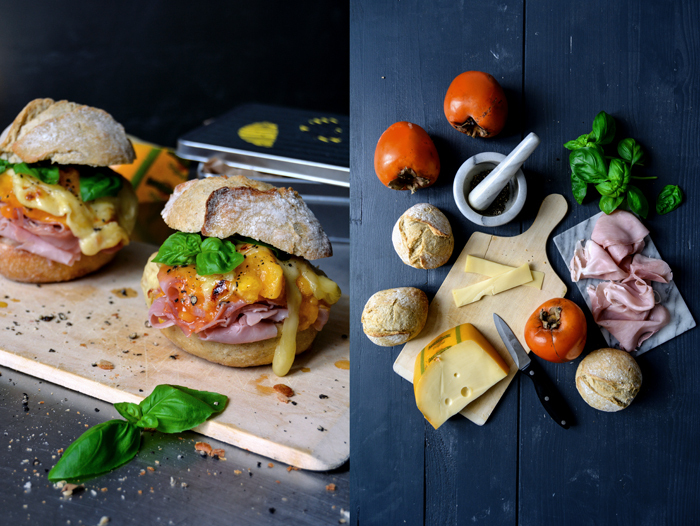 Follow #wirkäsebroten for more delicious sandwich recipes made with Leerdammer cheese! 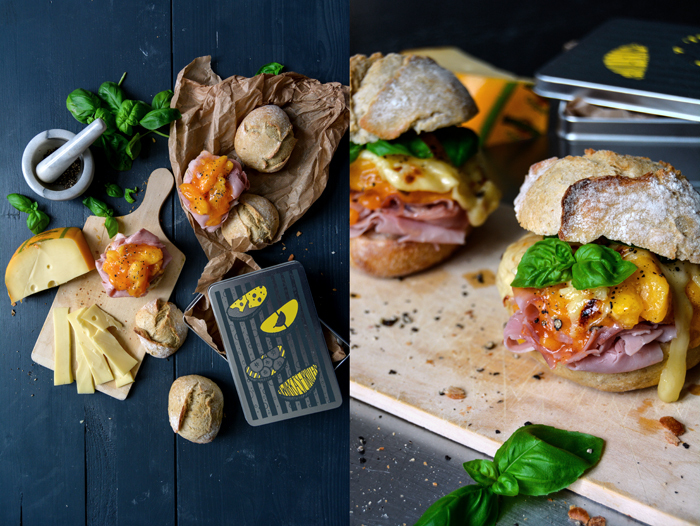 You’ve seen many sandwiches on my blog for my Sandwich-Wednesday series, but there has never been a giveaway competition – this is a premiere! 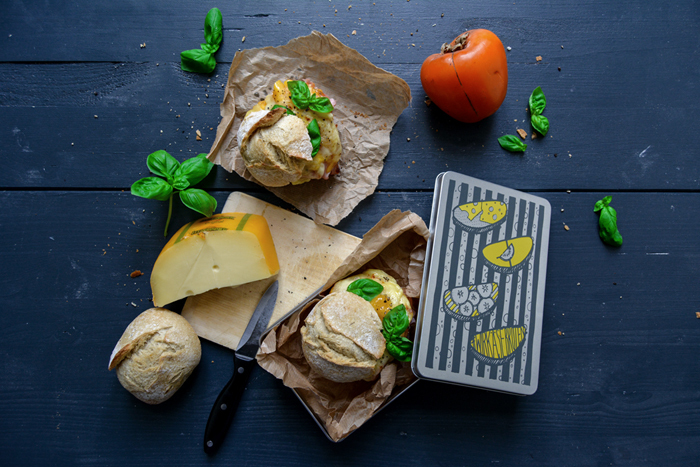 Leerdammer gave me five of their cute and robust metal sandwich boxes that are perfect to wrap up your sandwich safely for your next city picnic or lunch break. 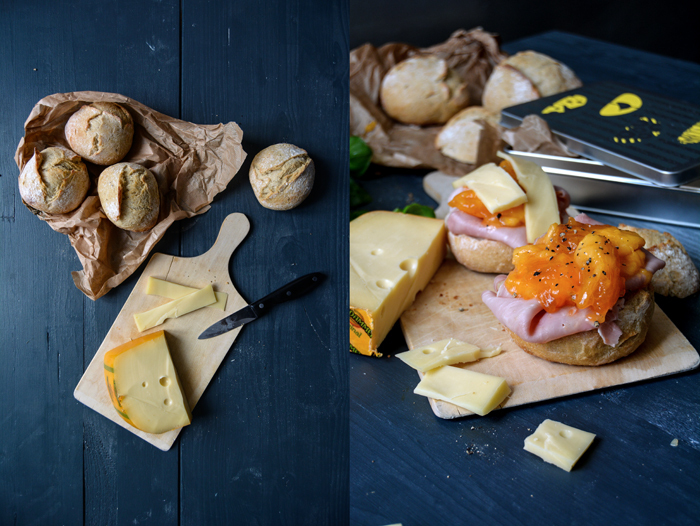 If you’d like to be the lucky owner of one of them, send me an email (eatinmykitchen@eatinmykitchen.meikepeters.com) or leave a comment at the bottom of this post and share your favourite cheese sandwich combination with me. Tell me about your secret ingredient, it can be a fruit, meat, sauce, anything you like. 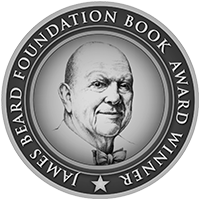 I’ll get in touch with you as soon as we have 5 winners. Good luck! This post is sponsored by Leerdammer and reminded me of a childhood favourite of mine. Thank you! 6th April: The competition is now closed. Thank you for all your delicious ideas! Set the oven to broiler or preheat to the highest temperature. 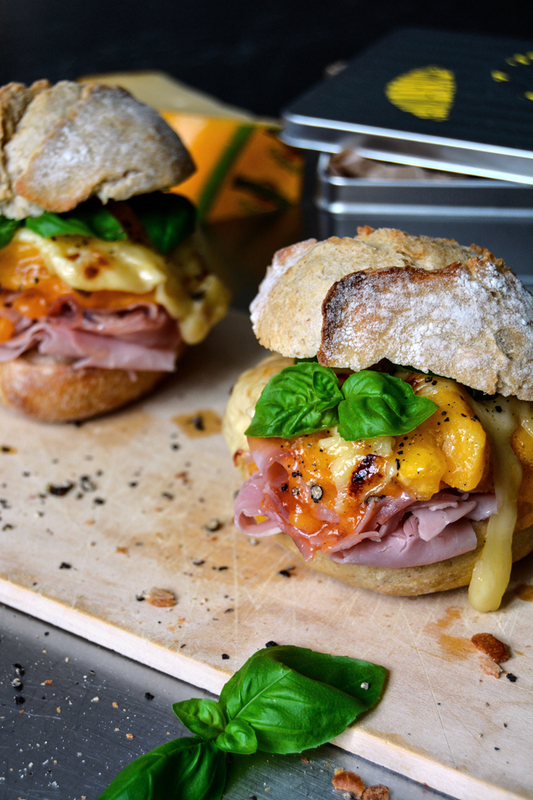 Divide the ham between the bottoms of the buns. 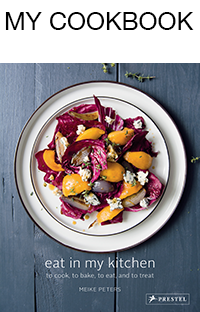 Lay the persimmon on top and cover with the cheese. Grill the sandwich in the oven until the cheese starts melting and sizzling, mind that the cheese doesn’t burn or slip off the fruit. Sprinkle the grilled cheese with crushed pepper and basil, close the bun, and enjoy. Thank you Rafaela! I never made a tofu sandwich for the blog, I think it’s time to give it a try! You’re creation sound delicious! YUM! 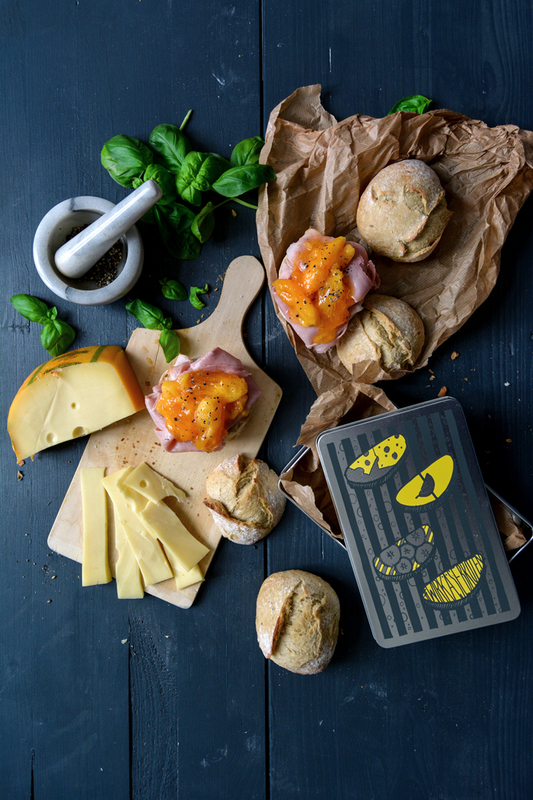 I am definitely making this one for hubby ASAP; he is the ultimate ham & cheese fan, but this take it to the next level 🙂 I love the addition of basil and peppercorns, which is a nice touch! My favorite sandwhich ingredients is all about the spread- a nice aoili or mayo mixture of some sort- yumm..
Ich liebe Käse-Sandwichs mit Avocado und roter Paprika . Dazu ein bißchen Salz und Pfeffer und fertig ist mein Lieblingssandwich!